I was asked a year in advance already of even longer to realize a stand for all friends and small manufacturers of eurorack modulars and/or other innovative tools for electronic music on the Musikmesse again – in 2015 i did it for those who asked and it became a big one. 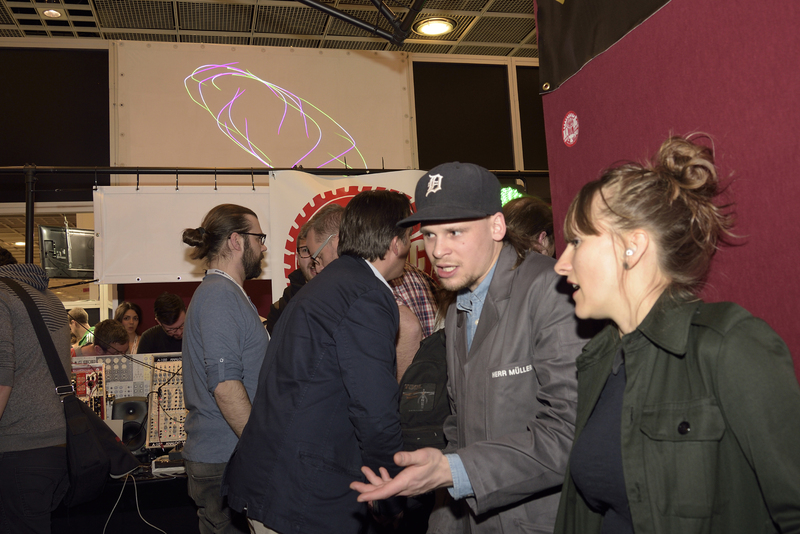 On two stands opposite we was 42 brands in the end with more than 60 exhibitor badges on 99 Square meters packed with stuff. The lane in between the stands and the stands themselves was nearly always packed and .. 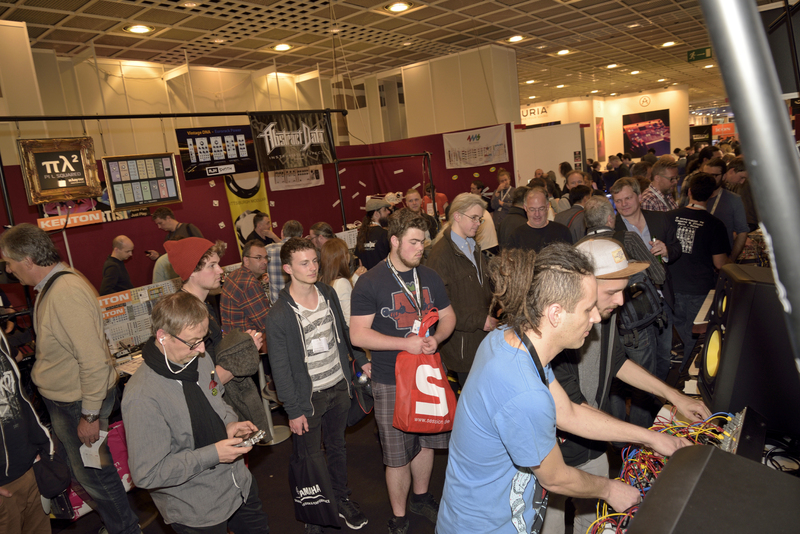 I guess it was the most crowded place in the most crowded hall (?). Everybody was happy having been a part of it as I heard afterwards more often. 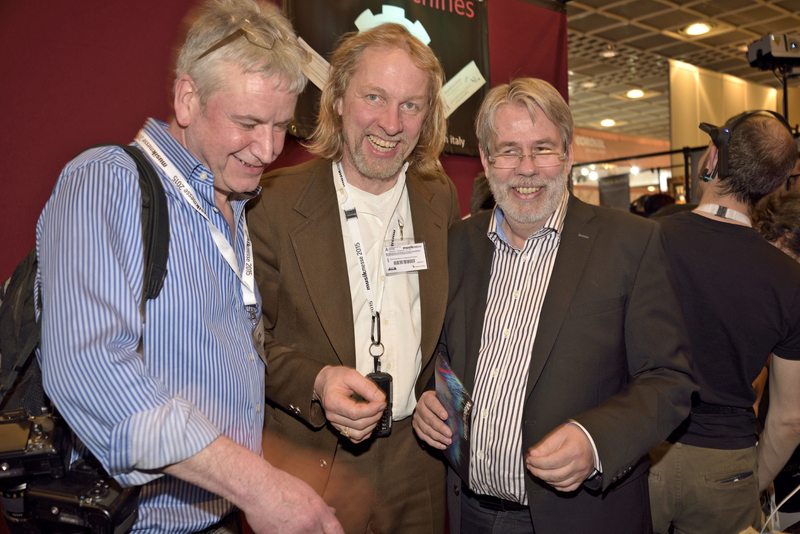 Please find a few more impressions here, made by Paul Pape visiting the show on Friday and Saturday. 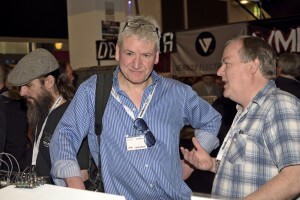 (Right) From left to right: Justin Owen alias Abstract Data, Ken Macbeth listening to Allan J. 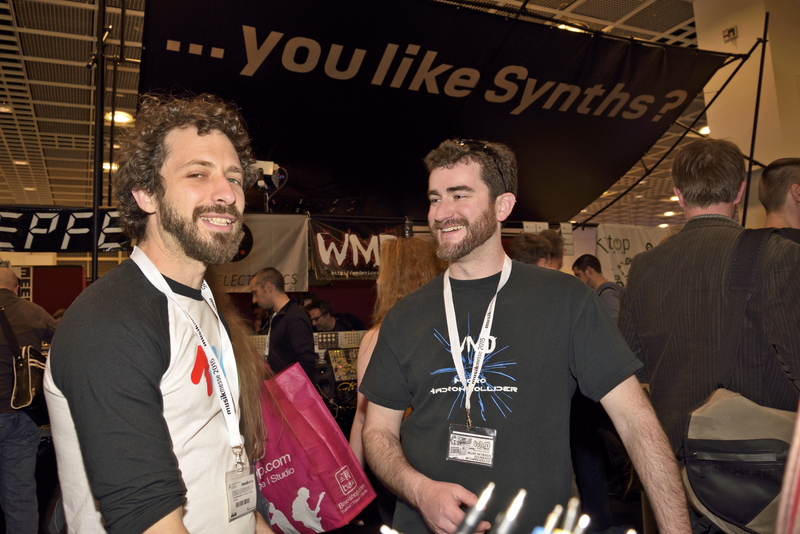 Hall alias AJH Synths talking about synthesizers? Ken was there from Thursday afternoon thru Saturday morning only, Allen was helping on the final uninstallation until the very end, a real hero – thank you very much again! Above: Music producer Garreth Jones watching and listening to Konstantin Gervis performing the tiptop audio modular presentation. 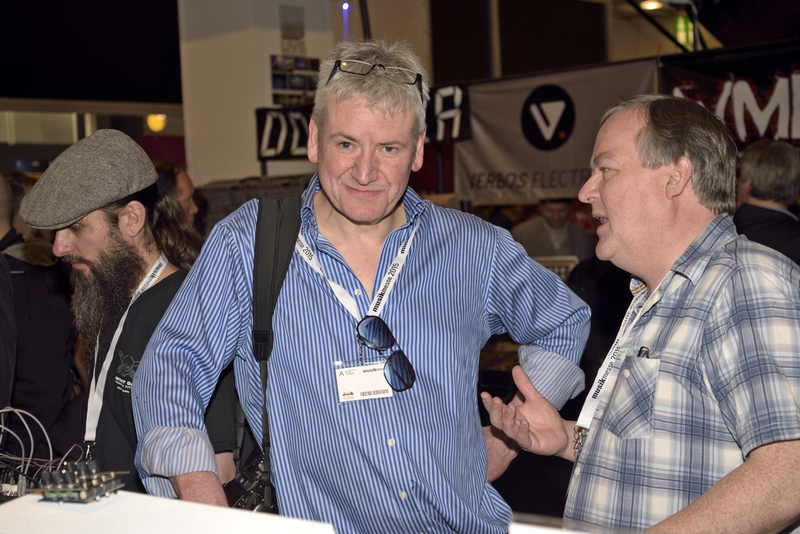 Left: Product Manager Jan-Hinnerk Helms listening to film music maker Mick Baumeister introducing the Midi breath control HB1 by Hornberg Research from Germany. 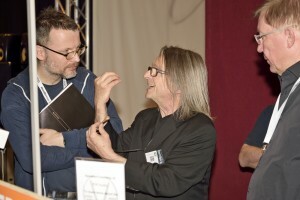 Above: Dieter Doepfer explaining the size of .. (?) an envelope (?) 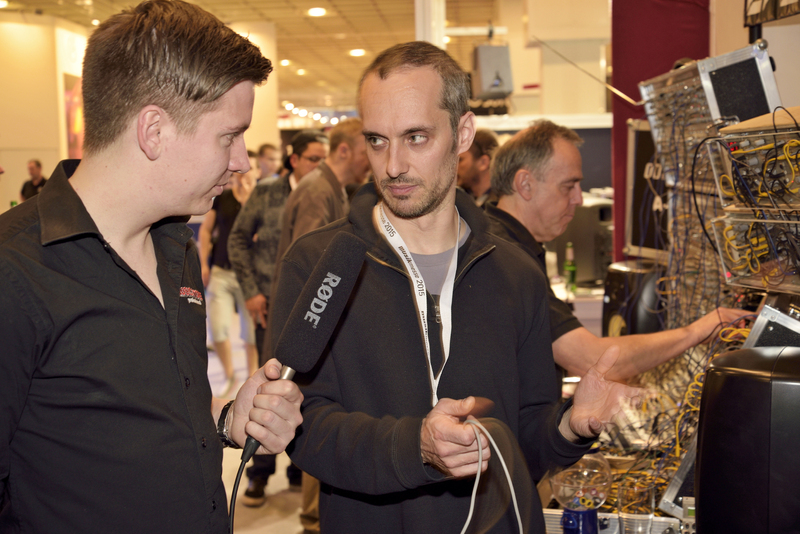 to our french partner from Mesi in France in front of his demo system. 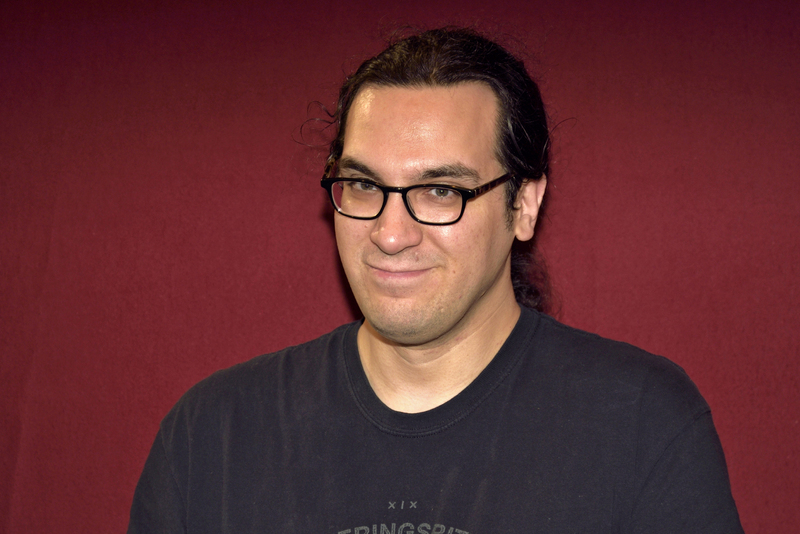 (Right hand): Scott Sebastian Jaeger alias The Harvestman (in civil cloths). 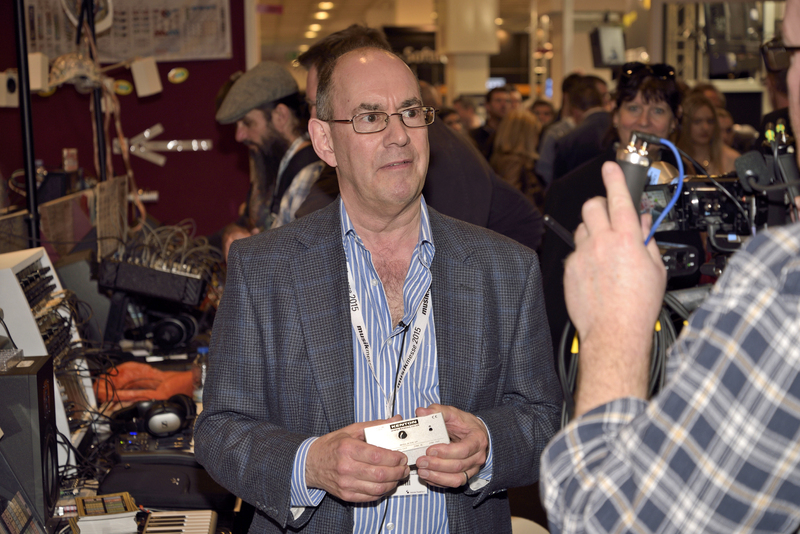 Above: John Price alias Kenton electronics (Wimbledon, London, UK) on his Inverview with Sonic State (see it here). Left: Ken Macbeth, HerrSchneider (me) and Wolfgang Dueren (ex CEO and a big enthusiast for TSI, Waldorf, PPG and more). 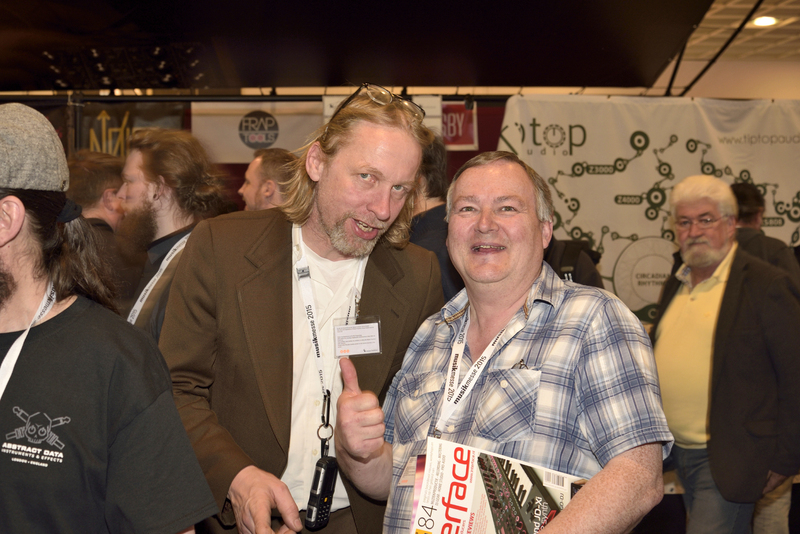 Above: Dan Greene alias 4MS pedals (left) having a good time with William Matthewson alias WMD (right). Jan Mueller from ALEX4 Distribution talking to Kelly Keibel alias Make Noise Music in Front of the projection of the Laser realized by Bernhard Rasinger (not on the pic). 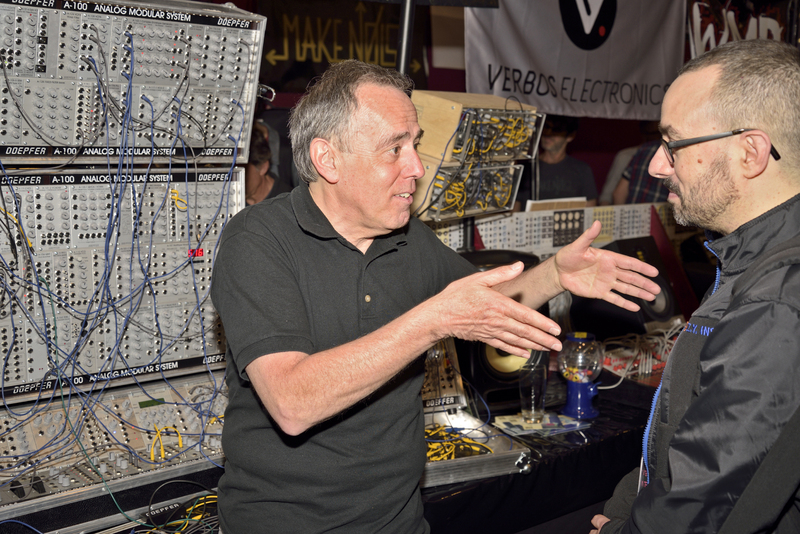 Mark Verbos alias Verbos Electronics from NYC introduced his touchplate keyboard and the multi envelope for the eurorack system to video stations and uncounted advanced modular users. 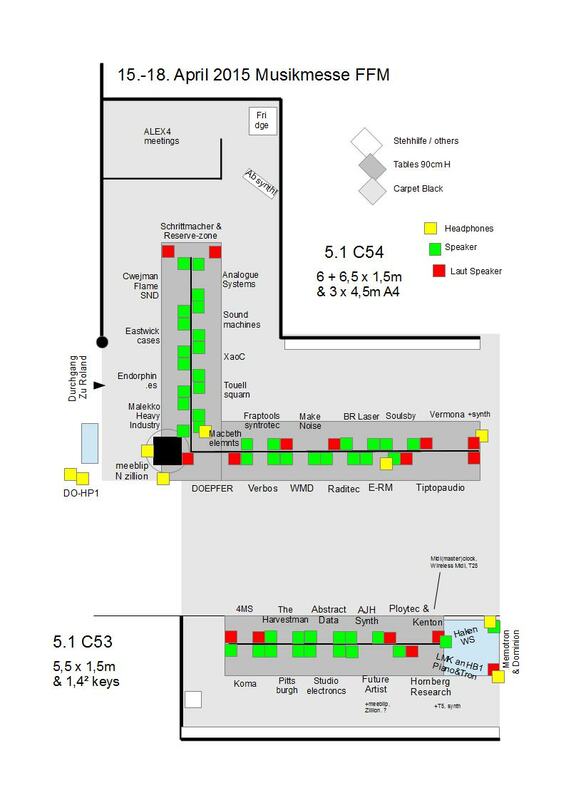 After Musikmesse he visited Berlin again to meet up friends and finally play a smart gig at the berghain (.. f#~ing doormen did not let me in!). 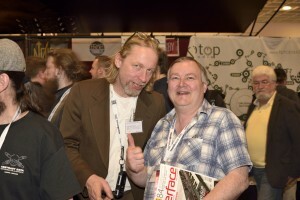 Right: Herr Schneider (too old for techno) here with Allen J. Hall alias AJH Synths (too techno to get old). 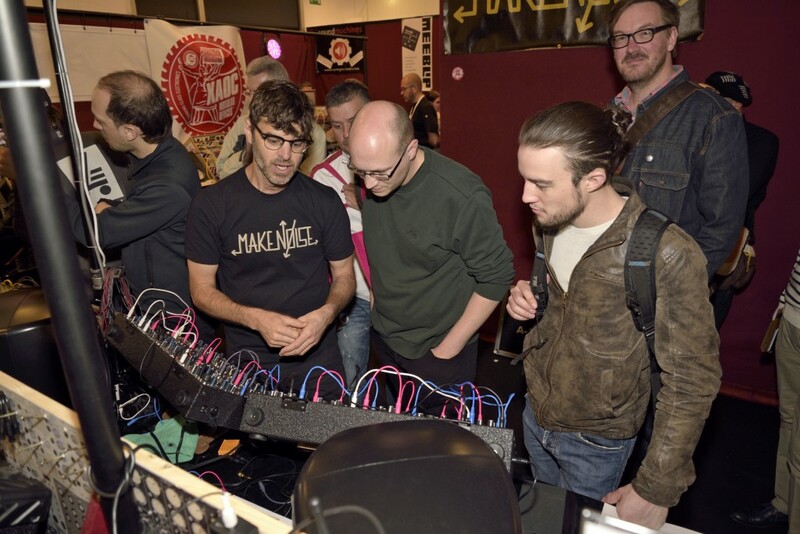 Above: Tony Rolando alias Make Noise Music introducing their system to the european audience. Together with his Partner Kelly Keibel he also visited Berlin after Musikmesse and gave another workshop at the Spiegelsalon. 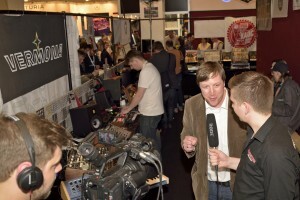 Left: Thomas Haller from Vermona giving a video demo to Music Store TV. 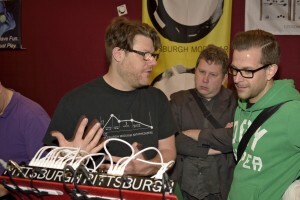 Richard Nicol alias Pittsburgh Modular introduced a pedal series for the eurorack to Ulf Lundblad alias Escape from Noise (tired in the back) ..
Below: A look thru the keyboard corner showing the Haken Continuum, MFBs Dominion, the new Manikin Memotron, The Doepfer Masterkeyboard LMK4+ and more. 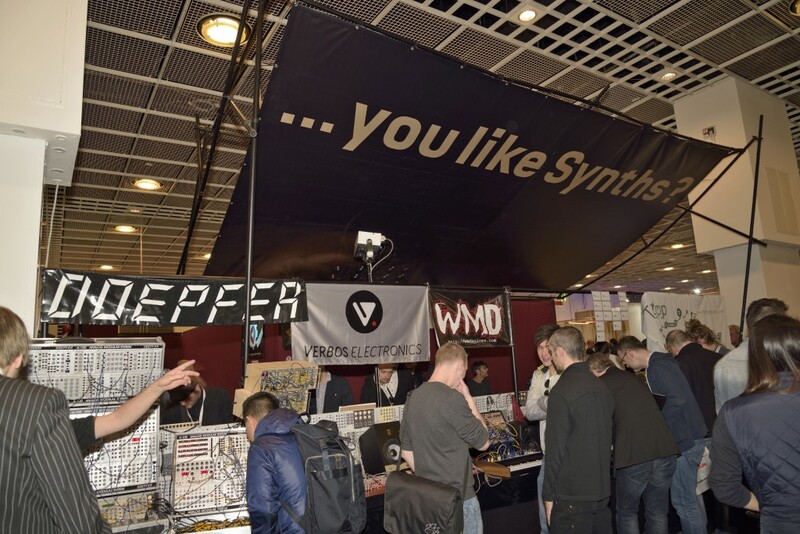 After we agreed to have a common Midiclock over both stands we distributed a clock and an audio information every full hour over a web of MidiThru, wireless midi converters and several Ploytec minisynths. The clock started at 10 bpm at 10 in the morning and ended with the last increase by another 10 bpm on 170 bpm at 17 oclock / 5pm .. every day. 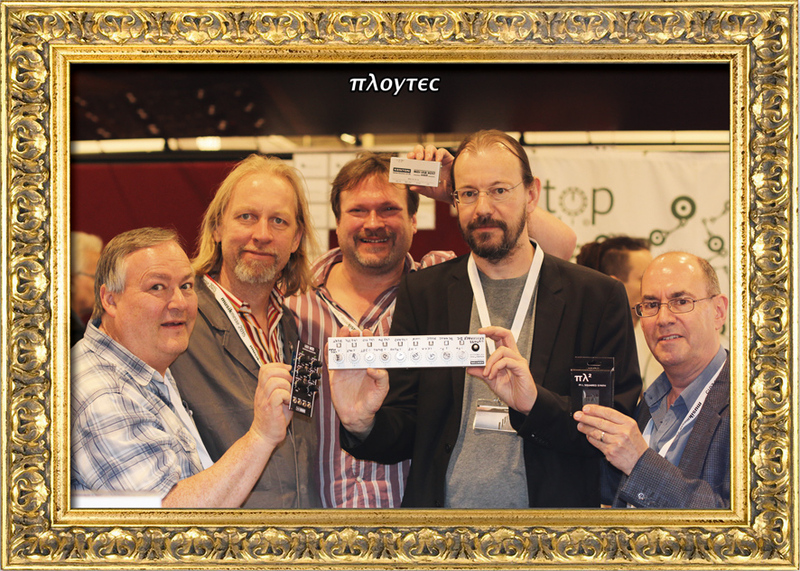 These gentlemen from ploytec, kenton and AJH Synth became good neighbors by doing it, thank you.Unfortunately a lot of others did not even recognize it, but thats their loose. And all the videos ..
.. or at least the most of them has been shot by our friends on Sonicstate, they made it an overview for us here! 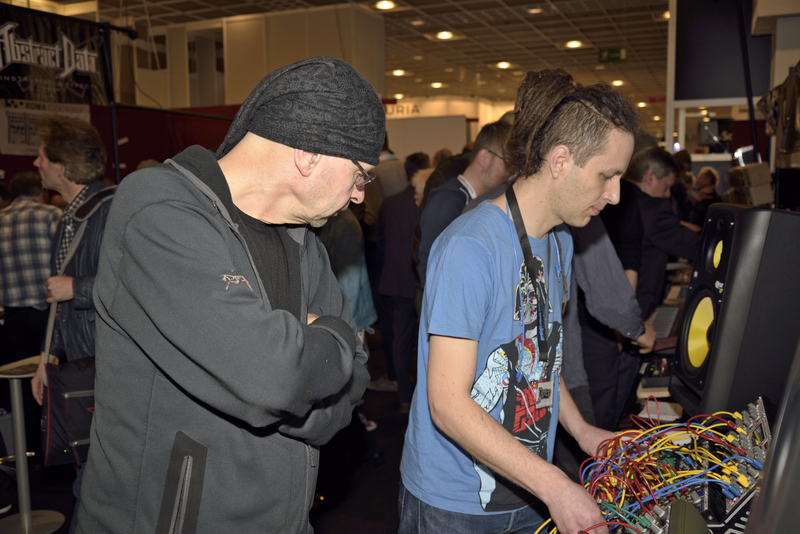 And the plan was this ..
On Musikmesse in Frankfurt – April, 15th til 18th, 2015 – we will exhibit more than 40 brands of eurorack modulars and other synthesizers in HALL 5.1 on stands C53 and C54. Every company has just a little part on the long tables and I am sure we will have a good time there together. 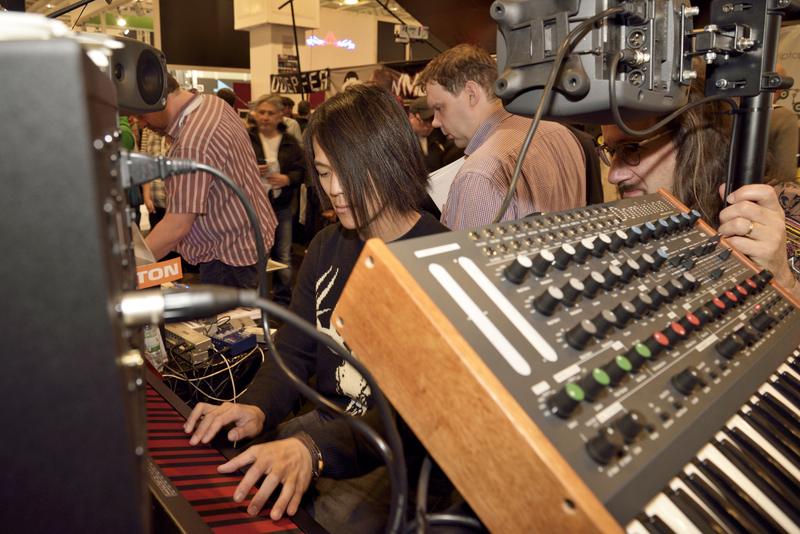 Next to us right hand roland from Japan has taken place, left hand there is moog music with their news as always.